Near Field Communication has the potential to become the standard for RFID-based consumer applications. Although it has been around for a while the standard is now starting to be supported by a growing number of devices and more software applications. Almost 300 NFC compatible mobile phone models are available now (including the Apple iPhone 6) and major credit card companies have committed to its use as well. But what is NFC all about? 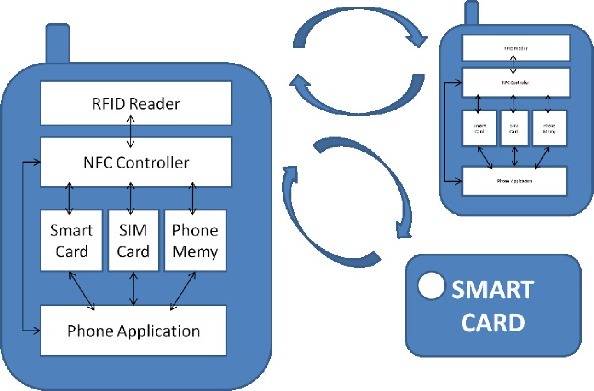 The NFC or Near Field Communication standard was developed primarily as a tool to extend the capability of mobile phones by enabling them to interact with contact smartcards and with one another over a simple two way communication protocol. From its origins in 2003, it is now a mature set of standards with a growing range of technology available for applications. It is supported by over 14 mobile telecoms network operators, together responsible for over 40% of the global network connections. The NFC Near Field Communication standard focuses on three activities. Firstly it allows a reader device to interact with a passive radio frequency device, typically a contactless smart card. Secondly the reader device incorporates its own contactless smart card which it can use as part of the transaction. Thirdly it allows two reading devices to exchange data. pass on tickets to others by transferring value from one phone to another. Ticket values on the phones could be recharged by touching the phone against NFC ‘top-up’ points. The first aspect of NFC is indistinguishable from existing RFID solutions and, in fact the NFC standard uses standards commonly found in RFID applications. The rules governing the interaction of the reader and the passive device being interrogated are defined by ISO1443, a commonly used high-frequency RFID standard. The smart card aspects of the interaction are handled by standards familiar to RFID users such as Mifare. The third capability is that of simple data exchange between two intelligent NFC devices. In this respect NFC can be compared to Bluetooth. NFC however, is based on a simple ‘touch’ to establish an exchange between devices (rather than the complex pairing arrangement needed by Bluetooth). NFC is also only a two device point to point network, compared with the more complex Bluetooth multi-device network. NFC is defined as operating in the high-frequency RFID spectrum at 13.56MHz. As such it supports reading of tags over distances of typically only a few centimetres. NFC tags should be readable by any ISO1443 compatible reader but an NFC application also needs to implement the standards defined by the NFC Forum. These standards cover such areas as Data Exchange Format, Tag Types, Record Type Definitions, and protocols. Most applications for NFC to date have been in the consumer arena with projects involving Manchester United Football Club, Barclays and Transport for London which is using NFC as an extension to its current Mifare based Oyster Card ticket system. More business oriented applications are also starting to appear. iConnect, one of CoreRFID’s partners, has provided a version of its care monitoring system that uses NFC devices to allow care workers to check in with their clients. Other application areas identified by the NFC Forum include information kiosks, vending machines and retail applications and applications such as using NFC devices to identify museum exhibits as guides for visitors have also been trialled.